GO where you may within the bounds of California, mountains are ever in sight, charming and glorifying every landscape. Yet so simple and massive is the topography of the State in general views, that the main central portion displays only one valley, and two chains of mountains which seem almost perfectly regular in trend and height: the Coast Range on the west side, the Sierra Nevada on the east. These two ranges coming together in curves on the north and south inclose a magnificent basin, with a level floor more than 400 miles long, and from 35 to 60 miles wide. This is the grand Central Valley of California, the waters of which have only one outlet to the sea through the Golden Gate. But with this general simplicity of features there is great complexity of hidden detail. The Coast Range, rising as a grand green barrier against the ocean, from 2000 to 8000 feet high, is composed of innumerable forest-crowned spurs, ridges, and rolling hill-waves which inclose a multitude of smaller valleys; some looking out through long, forest-lined vistas to the sea; others, with but few trees, to the Central Valley; while a thousand others yet smaller are embosomed and concealed in mild, round-browed hills, each with its own climate, soil, and productions. Making your way through the mazes of the Coast Range to the summit of any of the inner peaks or passes opposite San Francisco, in the clear springtime, the grandest and most telling of all California landscapes is outspread before you. At your feet lies the great Central Valley glowing golden in the sunshine, extending north and south farther than the eye can reach, one smooth, flowery, lake-like bed of fertile soil. Along its eastern margin rises the mighty Sierra, miles in height, reposing like a smooth, cumulous cloud in the sunny sky, and so gloriously colored, and so luminous, it seems to be not clothed with light, but wholly composed of it, like the wall of some celestial city. Along the top, and extending a good way down, you see a pale, pearl-gray belt of snow; and below it a belt of blue and dark purple, marking the extension of the forests; and along the base of the range a broad belt of rose-purple and yellow, where lie the miner’s gold-fields and the foot-hill gardens. All these colored belts blending smoothly make a wall of light ineffably fine, and as beautiful as a rainbow, yet firm as adamant. When I first enjoyed this superb view, one glowing April day, from the summit of the Pacheco Pass, the Central Valley, but little trampled or plowed as yet, was one furred, rich sheet of golden compositæ, and the luminous wall of the mountains shone in all its glory. Then it seemed to me the Sierra should be called not the Nevada, or Snowy Range, but the Range of Light. And after ten years spent in the heart of it, rejoicing and wondering, bathing in its glorious floods of light, seeing the sunbursts of morning among the icy peaks, the noonday radiance on the trees and rocks and snow, the flush of the alpenglow, and a thousand dashing waterfalls with their marvelous abundance of irised spray, it still seems to me above all others the Range of Light, the most divinely beautiful of all the mountain-chains I have ever seen. The Sierra is about 500 miles long, 70 miles wide, and from 7000 to nearly 15,000 feet high. In general views no mark of man is visible on it, nor anything to suggest the richness of the life it cherishes, or the depth and grandeur of its sculpture. None of its magnificent forest-crowned ridges rises much above the general level to publish its wealth. No great valley or lake is seen, or river, or group of well-marked features of any kind, standing out in distinct pictures. Even the summit-peaks, so clear and high in the sky, seem comparatively smooth and featureless. Nevertheless, glaciers are still at work in the shadows of the peaks, and thousands of lakes and meadows shine and bloom beneath them, and the whole range is furrowed with cañons to a depth of from 2000 to 5000 feet, in which once flowed majestic glaciers, and in which now flow and sing a band of beautiful rivers. Though of such stupendous depth, these famous cañons are not raw, gloomy, jagged-walled gorges, savage and inaccessible. With rough passages here and there they still make delightful pathways for the mountaineer, conducting from the fertile lowlands to the highest icy fountains, as a kind of mountain streets full of charming life and light, graded and sculptured by the ancient glaciers, and presenting, throughout all their courses, a rich variety of novel and attractive scenery, the most attractive that has yet been discovered in the mountain-ranges of the world. In many places, especially in the middle region of the western flank of the range, the main cañons widen into spacious valleys or parks, diversified like artificial landscape-gardens, with charming groves and meadows, and thickets of blooming bushes, while the lofty, retiring walls, infinitely varied in form and sculpture, are fringed with ferns, flowering-plants of many species, oaks, and evergreens, which find anchorage on a thousand narrow steps and benches; while the whole is enlivened and made glorious with rejoicing streams that come dancing and foaming over the sunny brows of the cliffs to join the shining river that flows in tranquil beauty down the middle of each one of them. MOUNT TAMALPAIS—NORTH OF THE GOLDEN GATE. or nearly so, for thousands of feet, advance their brows in thoughtful attitudes beyond their companions, giving welcome to storms and calms alike, seemingly conscious yet heedless of everything going on about them, awful in stern majesty, types of permanence, yet associated with beauty of the frailest and most fleeting forms; their feet set in pine-groves and gay emerald meadows, their brows in the sky; bathed in light, bathed in floods of singing water, while snow-clouds, avalanches, and the winds shine and surge and wreathe about them as the years go by, as if into these mountain mansions Nature had taken pains to gather her choicest treasures to draw her lovers into close and confiding communion with her. Here, too, in the middle region of deepest cañons are the grandest forest-trees, the Sequoia, king of conifers, the noble Sugar and Yellow Pines, Douglas Spruce, Libocedrus, and the Silver Firs, each a giant of its kind, assembled together in one and the same forest, surpassing all other coniferous forests in the world, both in the number of its species and in the size and beauty of its trees. The winds flow in melody through their colossal spires, and they are vocal everywhere with the songs of birds and running water. Miles of fragrant ceanothus and manzanita bushes bloom beneath them, and lily gardens and meadows, and damp, ferny glens in endless variety of fragrance and color, compelling the admiration of every observer. Sweeping on over ridge and valley, these noble trees extend a continuous belt from end to end of the range, only slightly interrupted by sheer-walled cañons at intervals of about fifteen and twenty miles. Here the great burly brown bears delight to roam, harmonizing with the brown boles of the trees beneath which they feed. Deer, also, dwell here, and find food and shelter in the ceanothus tangles, with a multitude of smaller people. Above this region of giants, the trees grow smaller until the utmost limit of the timber line is reached on the stormy mountain-slopes at a height of from ten to twelve thousand feet above the sea, where the Dwarf Pine is so lowly and hard beset by storms and heavy snow, it is pressed into flat tangles, over the tops of which we may easily walk. Below the main forest belt the trees likewise diminish in size, frost and burning drouth repressing and blasting alike. The rose-purple zone along the base of the range comprehends nearly all the famous gold region of California. And here it was that miners from every country under the sun assembled in a wild, torrent-like rush to seek their fortunes. On the banks of every river, ravine, and gully they have left their marks. Every gravel- and boulder-bed has been desperately riddled over and over again. But in this region the pick and shovel, once wielded with savage enthusiasm, have been laid away, and only quartz-mining is now being carried on to any considerable extent. The zone in general is made up of low, tawny, waving foot-hills, roughened here and there with brush and trees, and outcropping masses of slate, colored gray and red with lichens. The smaller masses of slate, rising abruptly from the dry, grassy sod in leaning slabs, look like ancient tombstones in a deserted burying-ground. In early spring, say from February to April, the whole of this foot-hill belt is a paradise of bees and flowers. Refreshing rains then fall freely, birds are busy building their nests, and the sunshine is balmy and delightful. But by the end of May the soil, plants, and sky seem to have been baked in an oven. Most of the plants crumble to dust beneath the foot, and the ground is full of cracks; while the thirsty traveler gazes with eager longing through the burning glare to the snowy summits looming like hazy clouds in the distance. The trees, mostly Quercus Douglasii and Pinus Sabiniana , thirty to forty feet high, with thin, pale-green foliage, stand far apart and cast but little shade. Lizards glide about on the rocks enjoying a constitution that no drouth can dry, and ants in amazing numbers, whose tiny sparks of life seem to burn the brighter with the increasing heat, ramble industriously in long trains in search of food. Crows, ravens, magpies—friends in distress—gather on the ground beneath the best shade-trees, panting with drooping wings and bills wide open, scarce a note from any of them during the midday hours. Quails, too, seek the shade during the heat of the day about tepid pools in the channels of the larger mid-river streams. Rabbits scurry from thicket to thicket among the ceanothus bushes, and occasionally a long-eared hare is seen cantering gracefully across the wider openings. The nights are calm and dewless during the summer, and a thousand voices proclaim the abundance of life, notwithstanding the desolating effect of dry sunshine on the plants and larger animals. The hylas make a delightfully pure and tranquil music after sunset; and coyotes, the little, despised dogs of the wilderness, brave, hardy fellows, looking like withered wisps of hay, bark in chorus for hours. 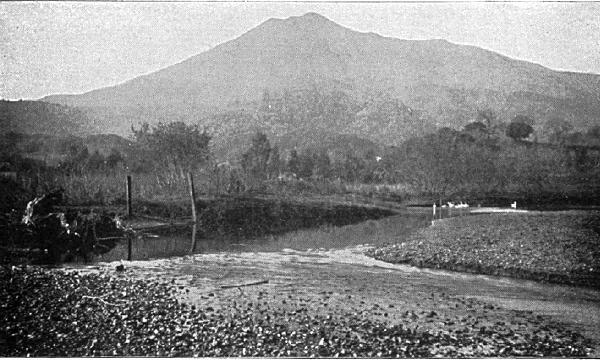 Mining-towns, most of them dead, and a few living ones with bright bits of cultivation about them, occur at long intervals along the belt, and cottages covered with climbing roses, in the midst of orange and peach orchards, and sweet-scented hay-fields in fertile flats where water for irrigation may be had. But they are mostly far apart, and make scarce any mark in general views. Every winter the High Sierra and the middle forest region get snow in glorious abundance, and even the foot-hills are at times whitened. Then all the range looks like a vast beveled wall of purest marble. The rough places are then made smooth, the death and decay of the year is covered gently and kindly, and the ground seems as clean as the sky. And though silent in its flight from the clouds, and when it is taking its place on rock, or tree, or grassy meadow, how soon the gentle snow finds a voice! Slipping from the heights, gathering in avalanches, it booms and roars like thunder, and makes a glorious show as it sweeps down the mountain-side, arrayed in long, silken streamers and wreathing, swirling films of crystal dust. The north half of the range is mostly covered with floods of lava, and dotted with volcanoes and craters, some of them recent and perfect in form, others in various stages of decay. The south half is composed of granite nearly from base to summit, while a considerable number of peaks, in the middle of the range, are capped with metamorphic slates, among which are Mounts Dana and Gibbs to the east of Yosemite Valley. Mount Whitney, the culminating point of the range near its southern extremity, lifts its helmet-shaped crest to a height of nearly 14,700 feet. Mount Shasta, a colossal volcanic cone, rises to a height of 14,440 feet at the northern extremity, and forms a noble landmark for all the surrounding region within a radius of a hundred miles. Residual masses of volcanic rocks occur throughout most of the granitic southern portion also, and a considerable number of old volcanoes on the flanks, especially along the eastern base of the range near Mono Lake and southward. But it is only to the northward that the entire range, from base to summit, is covered with lava. From the summit of Mount Whitney only granite is seen. Innumerable peaks and spires but little lower than its own storm-beaten crags rise in groups like forest-trees, in full view, segregated by cañons of tremendous depth and ruggedness. On Shasta nearly every feature in the vast view speaks of the old volcanic fires. 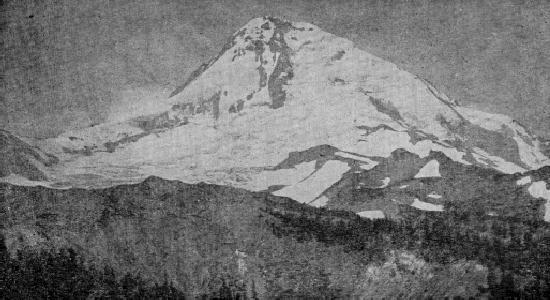 Far to the northward, in Oregon, the icy volcanoes of Mount Pitt and the Three Sisters rise above the dark evergreen woods. Southward innumerable smaller craters and cones are distributed along the axis of the range and on each flank. Of these, Lassen’s Butte is the highest, being nearly 11,000 feet above sea-level. Miles of its flanks are reeking and bubbling with hot springs, many of them so boisterous and sulphurous they seem ever ready to become spouting geysers like those of the Yellowstone. The Cinder Cone near marks the most recent volcanic eruption in the Sierra. It is a symmetrical truncated cone about 700 feet high, covered with gray cinders and ashes, and has a regular unchanged crater on its summit, in which a few small Two-leaved Pines are growing. These show that the age of the cone is not less than eighty years. It stands between two lakes, which a short time ago were one. Before the cone was built, a flood of rough vesicular lava was poured into the lake, cutting it in two, and, overflowing its banks, the fiery flood advanced into the pine-woods, overwhelming the trees in its way, the charred ends of some of which may still be seen projecting from beneath the snout of the lava-stream where it came to rest. 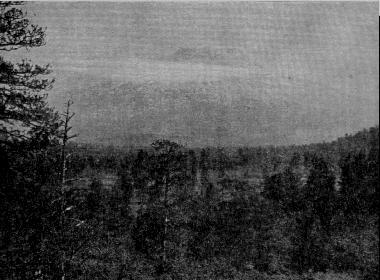 Later still there was an eruption of ashes and loose obsidian cinders, probably from the same vent, which, besides forming the Cinder Cone, scattered a heavy shower over the surrounding woods for miles to a depth of from six inches to several feet. The history of this last Sierra eruption is also preserved in the traditions of the Pitt River Indians. They tell of a fearful time of darkness, when the sky was black with ashes and smoke that threatened every living thing with death, and that when at length the sun appeared once more it was red like blood. Less recent craters in great numbers roughen the adjacent region; some of them with lakes in their throats, others overgrown with trees and flowers, Nature in these old hearths and firesides having literally given beauty for ashes. On the northwest side of Mount Shasta there is a subordinate cone about 3000 feet below the summit, which has been active subsequent to the breaking up of the main ice-cap that once covered the mountain, as is shown by its comparatively unwasted crater and the streams of unglaciated lava radiating from it. The main summit is about a mile and a half in diameter, bounded by small crumbling peaks and ridges, among which we seek in vain for the outlines of the ancient crater. These ruinous masses, and the deep glacial grooves that flute the sides of the mountain, show that it has been considerably lowered and wasted by ice; how much we have no sure means of knowing. Just below the extreme summit hot sulphurous gases and vapor issue from irregular fissures, mixed with spray derived from melting snow, the last feeble expression of the mighty force that built the mountain. Not in one great convulsion was Shasta given birth. The crags of the summit and the sections exposed by the glaciers down the sides display enough of its internal framework to prove that comparatively long periods of quiescence intervened between many distinct eruptions, during which the cooling lavas ceased to flow, and became permanent additions to the bulk of the growing mountain. With alternate haste and deliberation eruption succeeded eruption till the old volcano surpassed even its present sublime height. steadfast for ages, have suddenly blazed into violent action, and poured forth overwhelming floods of fire. It is known that more than a thousand years of cool calm have intervened between violent eruptions. Like gigantic geysers spouting molten rock instead of water, volcanoes work and rest, and we have no sure means of knowing whether they are dead when still, or only sleeping. Along the western base of the range a telling series of sedimentary rocks containing the early history of the Sierra are now being studied. But leaving for the present these first chapters, we see that only a very short geological time ago, just before the coming on of that winter of winters called the glacial period, a vast deluge of molten rocks poured from many a chasm and crater on the flanks and summit of the range, filling lake basins and river channels, and obliterating nearly every existing feature on the northern portion. At length these all-destroying floods ceased to flow. But while the great volcanic cones built up along the axis still burned and smoked, the whole Sierra passed under the domain of ice and snow. Then over the bald, featureless, fire-blackened mountains, glaciers began to crawl, covering them from the summits to the sea with a mantle of ice; and then with infinite deliberation the work went on of sculpturing the range anew. These mighty agents of erosion, halting never through unnumbered centuries, crushed and ground the flinty lavas and granites beneath their crystal folds, wasting and building until in the fullness of time the Sierra was born again, brought to light nearly as we behold it today, with glaciers and snow-crushed pines at the top of the range, wheat-fields and orange-groves at the foot of it. This change from icy darkness and death to life and beauty was slow, as we count time, and is still going on, north and south, over all the world wherever glaciers exist, whether in the form of distinct rivers, as in Switzerland, Norway, the mountains of Asia, and the Pacific Coast; or in continuous mantling folds, as in portions of Alaska, Greenland, Franz-Joseph-Land, Nova Zembla, Spitzbergen, and the lands about the South Pole. But in no country, as far as I know, may these majestic changes be studied to better advantage than in the plains and mountains of California. Toward the close of the glacial period, when the snow-clouds became less fertile and the melting waste of sunshine became greater, the lower folds of the ice-sheet in California, discharging fleets of icebergs into the sea, began to shallow and recede from the lowlands, and then move slowly up the flanks of the Sierra in compliance with the changes of climate. The great white mantle on the mountains broke up into a series of glaciers more or less distinct and river-like, with many tributaries, and these again were melted and divided into still smaller glaciers, until now only a few of the smallest residual topmost branches of the grand system exist on the cool slopes of the summit peaks. Plants and animals, biding their time, closely followed the retiring ice, bestowing quick and joyous animation on the new-born landscapes. Pine-trees marched up the sun-warmed moraines in long, hopeful files, taking the ground and establishing themselves as soon as it was ready for them; brown-spiked sedges fringed the shores of the newborn lakes; young rivers roared in the abandoned channels of the glaciers; flowers bloomed around the feet of the great burnished domes,—while with quick fertility mellow beds of soil, settling and warming, offered food to multitudes of Nature’s waiting children, great and small, animals as well as plants; mice, squirrels, marmots, deer, bears, elephants, etc. The ground burst into bloom with magical rapidity, and the young forests into birdsong: life in every form warming and sweetening and growing richer as the years passed away over the mighty Sierra so lately suggestive of death and consummate desolation only. It is hard without long and loving study to realize the magnitude of the work done on these mountains during the last glacial period by glaciers, which are only streams of closely compacted snow-crystals. Careful study of the phenomena presented goes to show that the pre-glacial condition of the range was comparatively simple: one vast wave of stone in which a thousand mountains, domes, cañons, ridges, etc., lay concealed. And in the development of these Nature chose for a tool not the earthquake or lightning to rend and split asunder, not the stormy torrent or eroding rain, but the tender snowflowers noiselessly falling through unnumbered centuries, the offspring of the sun and sea. Laboring harmoniously in in united strength they crushed and ground and wore away the rocks in their march, making vast beds of soil, and at the same time developed and fashioned the landscapes into the delightful variety of hill and dale and lordly mountain that mortals call beauty. Perhaps more than a mile in average depth has the range been thus degraded during the last glacial period,—a quantity of mechanical work almost inconceivably great. And our admiration must be excited again and again as we toil and study and learn that this vast job of rockwork, so far-reaching in its influences, was done by agents so fragile and small as are these flowers of the mountain clouds. Strong only by force of number, they carried away entire mountains, particle by particle, block by block, and cast them into the sea; sculptured, fashioned, modeled all the range, and developed its predestined beauty. All these new Sierra landscapes were evidently predestined, for the physical structure of the rocks on which the features of the scenery depend was acquired while they lay at least a mile deep below the pre-glacial surface. And it was while these features were taking form in the depths of the range, the particles of the rocks marching to their appointed places in the dark with reference to the coming beauty, that the particles of icy vapor in the sky marching to the same music assembled to bring them to the light. Then, after their grand task was done, these bands of snow-flowers, these mighty glaciers, were melted and removed as if of no more importance than dew destined to last but an hour. Few, however, of Nature’s agents have left monuments so noble and enduring as they. The great granite domes a mile high, the cañons as deep, the noble peaks, the Yosemite valleys, these, and indeed nearly all other features of the Sierra scenery, are glacier monuments. Contemplating the works of these flowers of the sky, one may easily fancy them endowed with life: messengers sent down to work in the mountain mines on errands of divine love. Silently flying through the darkened air, swirling, glinting, to their appointed places, they seem to have taken counsel together, saying, “Come, we are feeble; let us help one another. We are many, and together we will be strong. Marching in close, deep ranks, let us roll away the stones from these mountain sepulchers, and set the landscapes free. Let us uncover these clustering domes. Here let us carve a lake basin; there, a Yosemite Valley; here, a channel for a river with fluted steps and brows for the plunge of songful cataracts. Yonder let us spread broad sheets of soil, that man and beast may be fed; and here pile trains of boulders for pines and giant Sequoias. Here make ground for a meadow; there, for a garden and grove, making it smooth and fine for small daisies and violets and beds of heathy bryanthus, spicing it well with crystals, garnet feldspar, and zircon.” Thus and so on it has oftentimes seemed to me sang and planned and labored the hearty snow-flower crusaders; and nothing that I can write can possibly exaggerate the grandeur and beauty of their work. Like morning mist they have vanished in sunshine, all save the few small companies that still linger on the coolest mountainsides, and, as residual glaciers, are still busily at work completing the last of the lake basins, the last beds of soil, and the sculpture of some of the highest peaks.